On Giving Tuesday, make a difference for students at RCHS! Did you know that RCHS serves more than 1,000 kids each year living in high poverty areas within Rensselaer County? 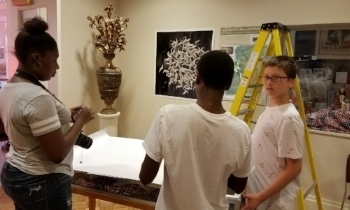 For those fortunate students whose schools can afford to transport them to downtown Troy, they experience first-hand the beauty and unique qualities of the 1827 Hart-Cluett House, Museum & Research Library. But for those whose schools are unable to cover modest $5 to $10 per student program fees or transport them here, we look to you, our loyal members and friends, to help RCHS become more accessible. Your gift to RCHS on this Giving Tuesday WILL impact individual students! Students come to RCHS for many award winning education programs including "Blast the Trumpet of Liberty: The Underground Railroad in Troy" and "History is Here to study the urban environment." In addition, RCHS assists students with their historical research. Working with teachers & librarians, RCHS provides primary source documents for their NYS Archives and NYS History Day competition entries. In both 2016 & 2017 students from Tamarac High School, aided by RCHS, were recipients of the NYS Archives Student Research awards! Youth who participate in RCHS education programs develop a better sense of place & stewardship of their communities. We open their eyes to history, inspiring enthusiasm for their roots. Please support RCHS now with your gift by clicking HERE and designate it to Giving Tuesday. You can make a difference in the lives of children in Rensselaer County - and beyond!